As we get older, we go through a number of cellular, physiological, and psychological changes. We need more Calcium, Vitamin D and B Vitamins, as well as some specific nutrients that are deficient or not present in a normal diet. Studies have shown that these nutrients play a very effective role in preventing, reversing and improving health conditions associated with aging. 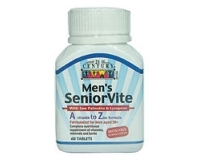 Men's Senior Vite is specially formulated to provide nutrients require by men over 50. 21st Century has developed Men's Senior Vite containing vitamins, herbs, minerals and some other nutrients to help provide strong nutritional supplementation for Senior Men. Take 2 tablets daily, 1 in the morning after breakfast and the second tablets to be taken not less than 6 hours before going to bed at night. If you are satisfied with your daily energy level, reduce dosage to one tablet daily. However, if you feel that your energy level is low, then return to taking 2 tablets daily. Each tablets contains a complete range of vitamins, minerals, herbs and nutritional supplements especially formulated to maintain good health and for energy, for men over 50. A vitamin to Zinc formula. Vitamin A, Vitamin B1, Vitamin B2, Vitamin B3, Vitamin B5, Vitamin B6, Vitamin B12, Vitamin C, Vitamin D, Natural Vitamin E.
Manganese, Chromium, Potassium, Copper, Calcium, Zinc, Magnesium, Selenium, Molybdenum. Garlic, Ginkgo Biloba. Saw Palmetto, Gymnema, Bitter Melon. PABA, Biotin, Folic Acid, Iodine, Choline, Inositol, dl-Methionine, Omega 3, Zeaxanthan, Lutein, Lysine, Lycopene, Grape Seed Extract. 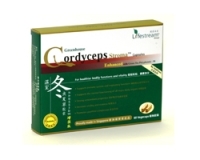 Used extensively as an aid to prostate health as well as a supplement for men`s health. Bitter Melon or Bitter Gourd helps to improve glucose tolerance and helps the body process blood sugars more effectively. Helps to improve general eye health. Used to reduce risks of cataracts and age-related eye degenerations. Lycopene is a powerful antioxidant that has shown remarkable fighting power against degenerative diseases. It is the ingredient that gives tomatoes their deep colour.